I won’t mince words here—deodorant is bad for you. When sweat leaves your body through your armpits, it carries toxins out with it. This is awesome–it’s like your pits are a self-cleaning oven and they help your body’s toxicity level go down. Deodorant with aluminum, however, stops the sweat from pouring out. This also stops the toxins from leaving your body in this way. You can use natural and non-aluminum deodorants, and there are even several great homemade versions (see list below). What I’ve found, as a sweaty person in general, is that I have to either reapply natural deodorant throughout the day (what, I live in California and it’s hot here! ), or I need to shower and air out my pits more often than once a day (not my style). 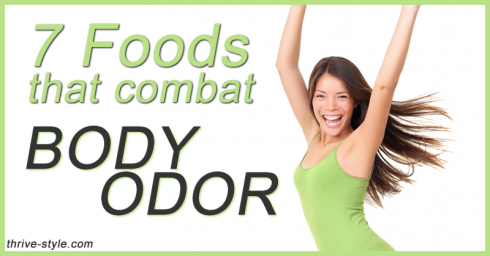 This led me to explore what foods can help improve body odor. Many people talk about the foods that cause more stink, and advise to stay away from them if you’re trying to stink less. This is great, but foods on the list include things like beef, which isn’t optional to the diets of many people. Of course, I recommend you eat less junk food, fast food, and processed food in general. This should improve your body odor in itself, but you can also add the following smell-good foods to your diet to help combat body odor. Consuming the foods above probably won’t completely de-stink your pits, but it should help! It could be the difference between having to reapply your natural deodorant halfway through the day or not. Many of the foods work through either detoxification methods that help to remove the stinky toxins via the digestive tract rather than having an abundance released through the armpits, or they deodorize the digestive tract naturally with the mechanism being related to the phytonutrient content. Taking supplements such as probiotics and/or those very high chlorophyl can help this process significantly as well. Once you begin incorporating more of these foods and supplements into your diet, you should notice a difference in your body odor within a few weeks! Just bought Lavilin for the first time. Excited to experiment with it. Heard Lavilin is the best one! I will try it in combination with your tips (love cilantro!) and let you know how it goes.